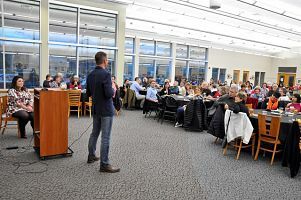 During National Volunteer Appreciation Week, Douglas County Libraries Director Bob Pasicznyuk welcomed a large audience at their annual volunteer appreciation event. The cruise-themed evening featured ‘Trivia Night’ aboard the Lido Deck. The library district celebrates its volunteers with a districtwide event every year in which volunteers across all seven libraries can mingle and feel the impact of being a part of a larger team and vision.